Can you live with your current speaker until you die? Discussion in 'Audio Hardware' started by thomaskong, Oct 5, 2018. ADS, Altec Lansing, Thiel, Canton, Apogee Duetta Signature(10years), B&W 801, Avalon Ascent, Wilson Audio Watt and Puppy6. I settled at Pacific Northwest area located just midway between Seattle and Vancouver BC around 6 years ago. It has a nice western view of Bay and Pacific Ocean with 2 acres lot. I could play music loud during midnight with no problem to my neighbors as long as I close the windows. With vaulted big space, my Lansche 4.1 speakers makes a beautiful voice out of classical, Jazz or even new age music. I had been living with the speaker since 2007. I do not claim that Lansche 4.1 is the best speaker in the world. 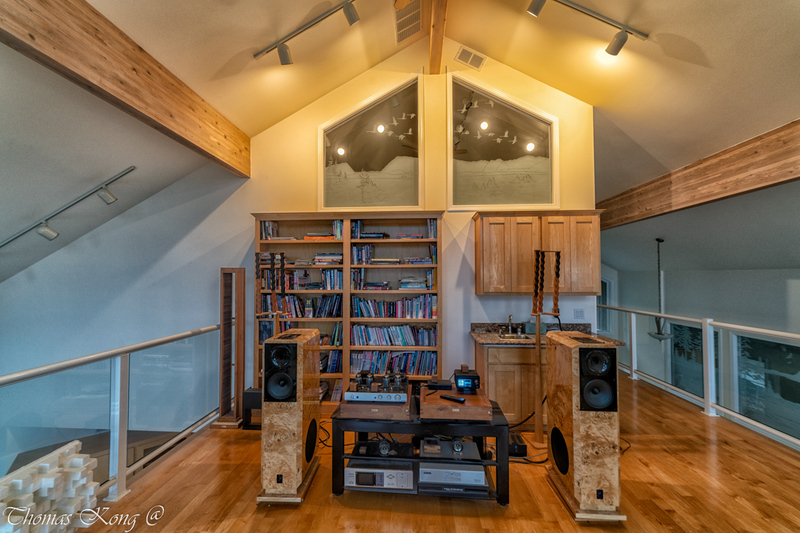 But with clean and pristine treble out of plasma tweeters and pretty good bass out of 2 10 inch driven by internal active amplifier and high efficiency (99db spec, but I believe it to be around 93db), it is hard to find better speaker with overall merit for my house. The only catch is that it can stop working since it is an active speaker( plasma tweeter and active bass unit). But I keep having good communication with Henry Dien of Lansche Audio who upgraded plasma tweeters twice at reasonable cost. I may upgrade the front end including amplifiers from time to time but I will keep my speaker as long as it works. I can happily live with Lansche 4.1 speakers at my present house for my life unless serious health issues happen to either me or my speakers. How about you gentlemen and ladies? Had any one of you found the speaker for your life? MisterNines, mj_patrick, KnotMyPrahblum and 18 others like this. No, I am planning a change. I would love to switch to Electrostatic but need to switch house first. mdm08033, timind and The FRiNgE like this. That's the plan, unless I win a big a$$ Lottery! HDOM, Fiddlefye, Tim Irvine and 3 others like this. Yes, very easily. To reach the next level of performance I would need to spend a minimum of £250,000 on equipment and even then I'm not sure I'd better what I've got without heavy use of room treatments. I may, however, be on the verge of upgrading my rear speakers if I can get the deal I want. Although I love my current speakers, they are too small for the room I just relocated to. I'm searching for a replacement speaker which I hope is my last real speaker purchase. KnotMyPrahblum, WapatoWolf, Manimal and 8 others like this. How do you when you are going to die? If you are planning a one-way trip to Dignitas, no is an easy answer. If you are planning to hang around for more than a decade, maybe is probably a more realistic answer. On the other hand, given the 'Murican gun laws, some crazy shooter or mad cop could blow your brains out tomorrow. Yup. Can only ever see me getting a better version of it. Yes, I am happy with my Janszen Valentinas (formerly known as zA2.1), and I could live with them for the rest of my days. Like you, I appreciate clean treble, which they have, in abundance. They sound more like live music than any other speakers I have had, and they interact less with the room than most. The Janszens also are reasonably compact, so they should work when and if we downsize. If eventually I go into assisted living or a nursing home, all bets are off. In a few weeks, I'll be 70 years old, so the "rest of my days" means something far different to me than it does to someone who is 29. And, of course, I'm at a different stage of financial life than a 29-year-old, as my career is (mostly) behind me. So when people answer, it might be nice to hear their ages. Gramps Tom, SirMarc, SandAndGlass and 1 other person like this. Thanks Mike for your detailed opinion. You also live in the Pacific coast area. I hope you enjoy your system with full satisfaction. I good with my back end. As long as the Cronus Magnum and Maggies last, I good with what I have. There's a bigger change I go with improvements on the front end. WapatoWolf, Stone Turntable, Tim Irvine and 1 other person like this. Yes, I could but I likely won’t. I don’t change equipment often (even less in the leaner, recent years) but I have a speaker problem. I can’t even count how many pairs of speakers I’ve owned and I’m still looking at more. SirMarc and timind like this. I am a happy user of Cronus Magnum for 7 years. I expect it to be good match with Maggies. Digital part keep improving fast, my EMM Lab Dac 2 was one of the best about 8 years ago, but I also consider updating the DAC. JNTEX and The FRiNgE like this. That is nice system you have and a spacious, pleasant environment. I am satisfied with my present near field setup, especially my current living space isn't really large enough for any other setup. I'm a speaker builder/ hobbyist, so my near fields exude stimulating and beautiful sound. (although they are revealing of source quality) I miss my electrostatics and large music room. Gramps Tom and SandAndGlass like this. About 11 years ago I enjoyed the same speaker in near field for 1 year with 8W SET amplifier. But after moving to the present house, it was hard to drive it with low powered SET. I am also interested in Electrostatic but they require big space for placement. I could live with what I have for the rest of my life no problem. I'm happy with my ATCs they've been in my system longer than anything else, compared them to a lot of other high end speakers, nothing was better, just different, not likely to be able to afford to replace them, if I could I'd likely just get newer active ATCs. I do, provided they last for about 50-60 years from now. I'm 43 and plan to live many many years. Man at C&A, Bananas&blow, ChuckyBuck and 1 other person like this. I guess; it ain't gonna be that long. MisterNines, Nascimento Brasil, Bananas&blow and 2 others like this. I have a friend listening to 90 years old Western Electric speakers which still works fine after some repair. Fiddlefye, The FRiNgE, SandAndGlass and 3 others like this. Hoping to make the move back to Maggie’s soon. I have enjoyed my Silverline Sonatina II’s, but some 3.7’s would be nice. mdm08033 and The FRiNgE like this.